The last few weeks have exposed that our equity markets are not as liquid as we have long claimed mainly due to market fragmentation and the lack of diverse liquidity pools. Mini flash crashes and larger events like the ETF flash crash of August 24th are proof that our current stock exchange model which has formed in the wake of Reg NMS has been a failure. High speed traders have been able to game this model largely with our assistance. We have developed a two tier market and have given special advantages to those that are willing to pay for services like colocation, private gateways and proprietary data feeds. We have also given out billions of dollars in rebates over the past few years to entice more high speed volume. Essentially, we have courted speed at the expense of price discovery. The rise of dark pools is another sign that our model has failed. 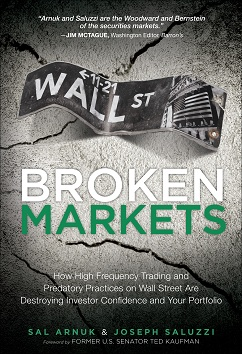 Institutional investors who have sought alternatives to our visible markets (which have become infested with predators looking for any signal to pick off an institutional or even retail order) have been led into a much murkier and even more predatory market. Recent record setting, multi-million dollar fines against brokers and banks who run these dark pools have proven that they are far from the safe alternative. The August 24th ETF flash crash was a dramatic liquidity event that shocked many investors. Unfortunately, we’ll continue to have these type of events until regulators realize that we have a market design problem. On August 24th, there were numerous trades which received inferior prices and were not broken. Most likely many of these were caused by market orders that might have been activated by stop-loss orders placed by retail investors. Since most brokers didn’t file a clearly erroneous trade report within thirty minutes of the trade, many investors were stuck with fills that were far away from the implied value of the ETF. We didn’t break any of these trades because we didn’t know where to draw the line like we arbitrarily did after the May 6, 2010 Flash Crash. We also didn’t want to leave our market makers with a one sided position that was unhedged. Sorry about that. We think many of today’s market structure problems were actually caused by poorly designed regulations, most notably Reg NMS. Prior to Reg NMS, the NYSE relied on specialists to provide a fair and orderly market in return for the right to have a franchise for a particular stock at the exchange. Reg NMS made this model obsolete and a new competing DMM model was developed. This DMM model does not rely on customer orders and has very few obligations leaving the market vulnerable in times of stress. To make matters worse, on the recent volatile days of the past few weeks, the NYSE has chosen to invoke Rule 48 since they do not have enough employees to effectively handle the opening process which is one of their most important functions. “No one on the planet operates that way, and no one should operate that way,” he said in an interview, adding that he sees “very limited value” in the use of humans on the trading floor. So what do we do now? We’re really not sure. We’ve already tried the “Grand Bargain” but that seems to be a bust now since so many dark pools are being fined by the SEC. We doubt the regulators are going to help much since, to borrow a phrase from Bloomberg’s Mike Regan, they are more akin to “mall cops on Segways trying to chase after high speed Maserati’s”. We wish we could offer an alternative but our short-term, for-profit model leads us to support the status quo. In the meantime, try not to enter any market orders and be sure to file that clearly erroneous trade report within 30 minutes of the next liquidity event. ← What Did the Dismissal of Some Lawsuits Against the Exchanges This Week Really Mean?